MICKEY NEWMAN LED the goal siege with a stunning hat-trick as Meath demolished hosts Carlow to book their Leinster football championship semi-final place. The Royals led by just a point after 22 minutes and looked nervy as Carlow ground out chance after chance. But Newman’s 24th minute penalty conversion opened the floodgates and a whopping six more green flags were raised by full-time. Newman helped himself to three overall while Man of the Match Bryan McMahon, Stephen Bray and Andrew Tormey and Dalton McDonagh also found the net. Carlow needed to start strong after a terrible league campaign that saw them finish bottom of Division 4. They carved out plenty of chances but kicked away around 1-2. And when Meath finally found their radar they punished the Barrowsiders’ profligacy with Newman’s penalty moving them 1-3 to 0-1 up. Carlow’s brittle resolve was completely broken by McMahon and Bray goals before half-time to leave Meath 3-6 to 0-2 up at half-time. There was no glorious fight-back either and Carlow managed just one score from open play in the entire game. As for Meath, they added four more second-half goals with Newman shooting his second and third in the 50th minute. The back to back Leinster finalists took the opportunity to run in their full allocation of subs with points from Seamus Kenny and Mark O’Sullivan. The Royals’ reward is a June 29 Leinster semi-final clash with Kildare who will provide a much stiffer challenge after hammering Louth. Meath scorers: Mickey Newman 3-2 (1f, 1-0pen), Andrew Tormey 1-3, Bryan McMahon 1-1, Stephen Bray and Dalton McDonagh 1-0 each, Seamus Kenny and Shane O’Rourke (1f) 0-2 each, Donncha Tobin, Damian Carroll and Mark O’Sullivan 0-1 each. Carlow scorers: Paul Broderick 0-5 (1 45, 3f), Seamus Kinsella 0-1 (1f). Subs: Seamus Kenny for Keogan (h/t), Adam Flanagan for Meade (46), Dalton McDonagh for G Reilly (51), Mark O’Sullivan for Burke (52), Paddy Gilsenan for Bray (54), Donal Lenihan for McMahon (60). Subs: Conor Lawlor for Mernagh (h/t), Kieran Nolan for Power (42), Eoghan Ruth for Foley (46), Willie Minchin for Moran (47), Jack Kennedy for Kinsella (55). 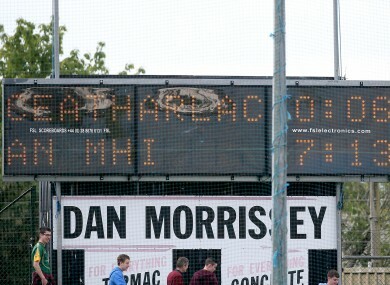 Email “Magnificent seven goals for Meath as they rout sorry Carlow”. Feedback on “Magnificent seven goals for Meath as they rout sorry Carlow”.